Saturday April 11th 1896 It was summer heat today. I swept the house all over and cleaned up thingsgenerally. Did some baking. Will went to town in the afternoon. i sewed all afternoon and evening. Sunday April 12th 1896 It is still very warm. I was busy most of the forenoon about the work. After an early dinner we went over home. Ott & Fanny got home last night. I am afraid Lee is no better. We spent a little time there and then went on over to Woolfs. It was time to do the evening work when we got home. I got sipper over and wrote some. 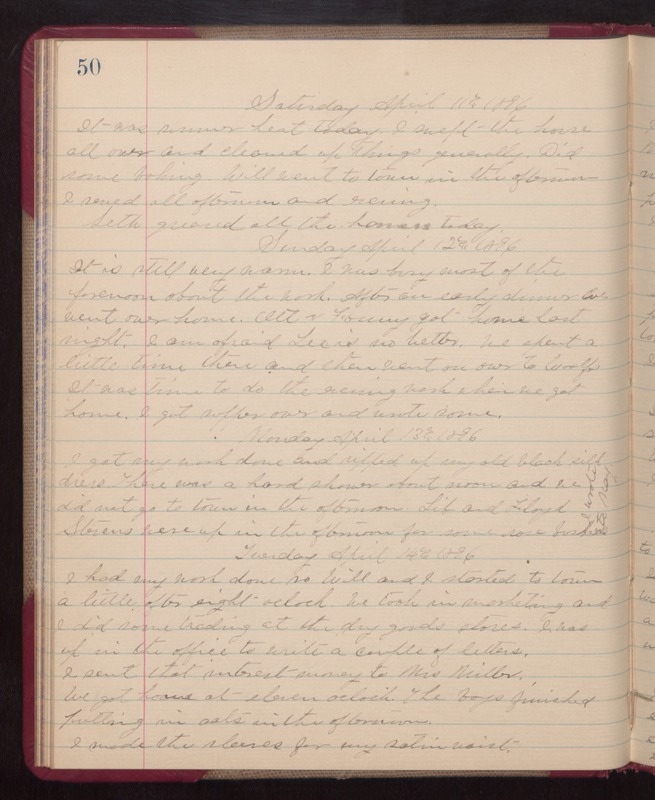 Monday April 13th 1896 I got my work done and ripped up my old black silk dress. There was a hard shower about noon and we did not go to town in the afternoon. Lib and Floyd Stevens were up in the afternoon for some rose bushes. I wrote to May. Tuesday April 14th 1896 I had my work down so Will and I started to town a little after eight oclock. We took in marketing and I did some trading at the dry goods stores. I was up in the office to write a couple of letters. I sent that interest money to Mrs Miller. We got home at eleven oclock. The boys finished putting in oats in the afternoon. I made the sleeves for my satin waist.